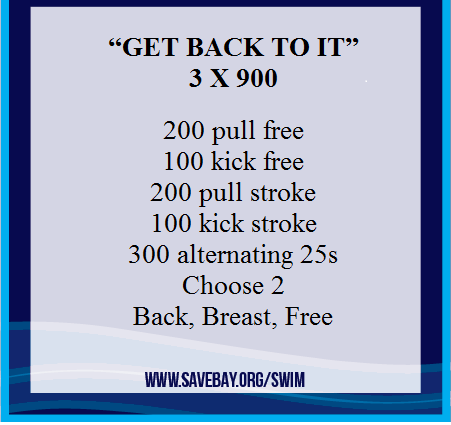 Are you a former swimmer looking to get back at it? 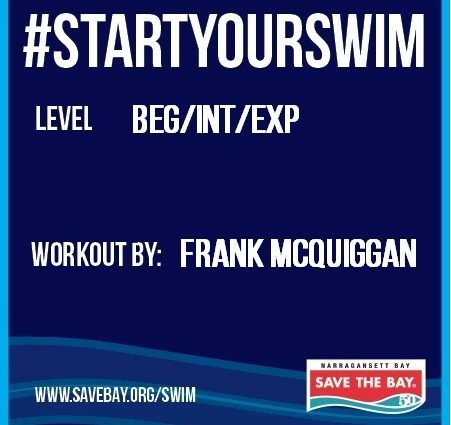 Give Frank McQuiggan’s—a Master Swimmer and member of Swim R.I.—workout a shot. For added insight and encouragement, be sure to take a look below for Frank’s explanation about why it can be so tricky to get back into swimming. “A runner can stop running for a while and pick it back up easier than a swimmer can ‘get back into it’ because there are only two good aerobic activities for the upper body: swimming and rowing. Runners who stop running still walk. Former college swimmers have an especially hard time coming back mentally because they have higher expectations. The body knows a pace and fights with the logical brain to try and keep those paces. These individuals tend to want to go faster, get depressed over slow times—’How could that possibly be only a 1:20! ?’— and become frustrated. For the 2019 Swim, Save The Bay is offering free workouts from master swimmers and open water coaches to our community in an effort to support all of our swimmers—from those attempting the Swim for the first time, to those who return to the event year after year.